Two ports operated by Global Ports Holding Plc., the largest cruise port operator in the world, welcomed the Symphony of the Seas on her maiden voyage. 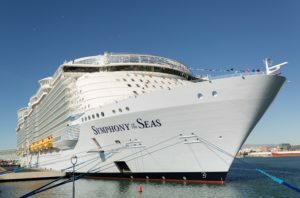 Malaga Cruise Port and Barcelona Cruise Port Creuers Terminals hosted the Symphony of the Seas, which is the 25th ship of the Miami-based cruise line Royal Caribbean. Today, it is the largest cruise ship in the world with a capacity of 6,750 passengers. Malaga Cruise Port was her first port of call on 27 March after leaving the STX France shipyard in Saint-Nazaire. A plaques and keys exchange ceremony took place onboard the newly arrived giant docked at the Levante pier, which was open for an entertainment programme that included a prize draw in support of charitable foundation Andrés Olivares, which helps children with cancer and other chronic diseases. Later, on 29 March, the Symphony of the Seas arrived in Barcelona, which will become her summer home port, as she will stay in the Mediterranean throughout the season and will call at Barcelona 33 times before the end of October. Symphony will sail on her seven-night maiden voyage with first passengers on board tomorrow, 7 April, from Barcelona. Starting from November, the cruise ship will operate Eastern and Western Caribbean cruises from her year-round home, Port Miami Terminal A. As we wrote earlier, this new world-class cruise terminal is being constructed now to be launched in October this year. Delivered to Royal Caribbean on 23 March 2018, the Symphony of the Seas is 361m long, has 18 decks and 2,759 staterooms. But apart from that, this luxurious floating hotel has more than 40 restaurants and bars, 23 pools, jacuzzis and water slides, two theatres, an ice skating-rink, a surf simulator, two rock climbing walls, a mini-golf course, a ten-storey fun slide, and of course, a spa, a gym, a casino and dozens of shops. But for Royal Caribbean that was not enough. The line declared its newest cruise ship the world’s “most Instagrammable”, as Russ Francis was appointed the company’s first “Instagrammer-in-Chief” to help guests make the most of their holiday moments and also inspire them to do the ship justice through their Instagram content.